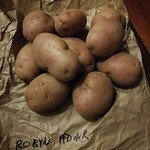 shiny is using Growstuff to discuss Tales of the Robyn Adair potato with a community of food gardeners worldwide. We have advice on growing hundreds of different crops, and a community from all around the world. Sign in or sign up to or to start using Growstuff to track what you're planting and harvesting.